My Makeup Box: What's In My Purse? 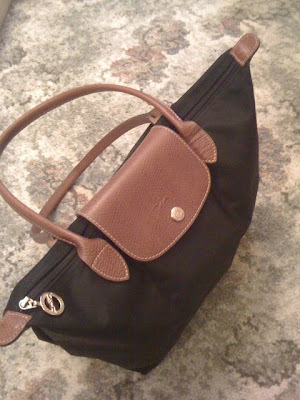 This is my beautiful, black Longchamps Tote bag that I bought in Paris last year. The material is really good quality and the bag only cost me €60, which is most definitely worth it, in my opinion. I have certainly gotten my value for money as I use it every day and I love it VERY much. 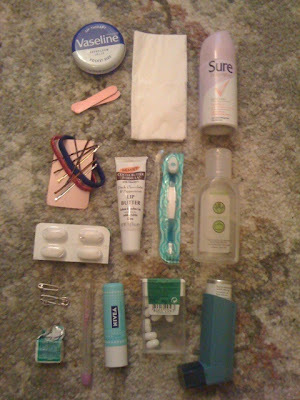 These are the contents of my beautiful bag. I'll start at the top left hand corner and work right and then down. Hope it's not too confusing!! If you need any clarification on anything, just leave me a comment. In the top, left corner is my leopard print makeup bag, and beside that is the book I'm reading at the moment (it's one of the Sookie Stackhouse books - From Dead To Worse). 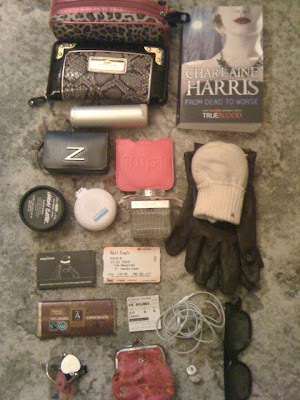 Underneath my makeup bag is my wallet (from River Island) and then a bottle of Her/Elle by Armani. Underneath the body spray is my digital camera in its case, and then my Benefit mirror and two pairs of gloves (one cream cosy pair and one brown leather pair). Underneath my camera is my container of Lush's Lemony Flutter cuticle butter, and beside that is my Sephora hairbrush, and a bottle of Chloé perfume (which I am currently in LOVE with). On the next row are some Wagamama vouchers and a train ticket I used on my trip to my boyfriend's house yesterday (gotta throw that in the bin). Under these is a full bar of dark chocolate, a ticket stub from the cinema (I went to see Sherlock Holmes this week) and the headphones for my iphone. On the bottom row are my keys, my coin and change purse and a pair of earrings. In the bottom righthand corner are a pair of 3D glasses that I got when I went to see Avatar this week!! I decided to show you all what I had in my makeup bag (I have put away most of the actual makeup as I change what I carry every day, but these are what I always have with me). In the top left corner is my trusty vaseline, spare tissues and a small bottle of deodorant. Underneath the vaseline are some teeny-tiny nail files that my Mummy gave me. Underneath these you can see my travel-sized collection of bobbins and hair clips, and beside them are some Palmers lipbalm, a travel tooth brush and some hand sanitiser. My panadol are beneath the hairclips, and under them are some safety pins, chewing gum and a pen. Obviously I always have my iphone with me too, but I used it to take these photos because my camera is still out of action. I really hope you enjoyed my little tag. I tag anyone who hasn't done this yet!! Haven't got so far to do it myself tough.